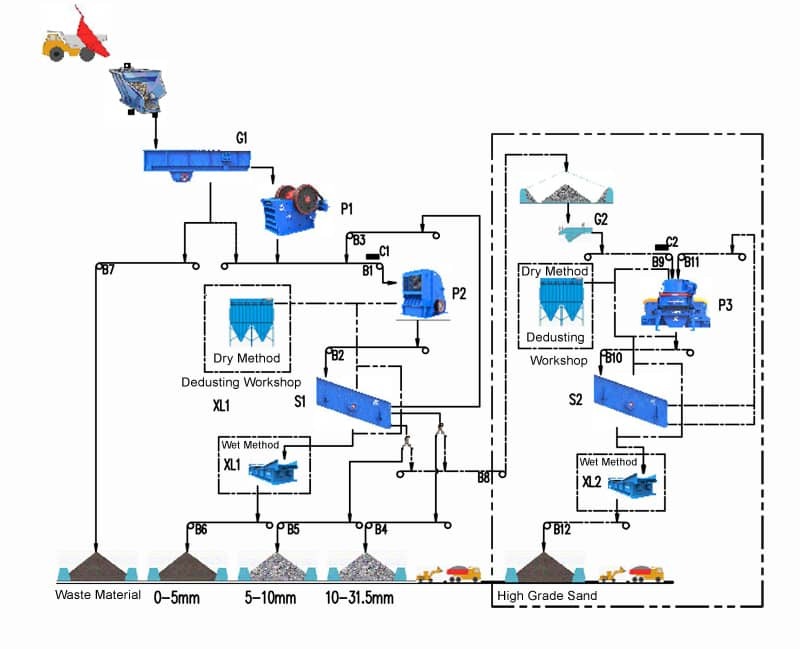 Home > News > Product Knowledge > How much does it cost to invest in a set of 50 t/h stone production line? How much does it cost to invest in a set of 50 t/h stone production line? When purchase the crusher machine, many customers will ask how much do we need to invest a stone production line and how to design the production line? I believe this is the problem that many customers have. When we configure the production line, we should consider many factors, such as stone property, hardness, site condition, and required production capacity, etc. Luoyang Dahua has rich site design experience, the company will dispatch the experienced engineer to the customer site for field visit and give the suitable solution. Stone production line consists of vibrating feeder, jaw crusher, impact crusher, PLS sand making machine, vibrating screen and sand washer. The raw stone materials are transported to jaw crusher through vibrating feeder for primary crushing, the crushed materials are sent to impact crusher or sand making machine for further crushing or re-shaping. Then the materials will be separated by vibrating screen. The material with bigger granularity will be re-sent to impact again for further crushing. If the clean aggregate is needed, then it could be sent to the sand washing machine for cleaning. Jaw crusher: It is used for primary crushing of various kinds of stone and rocks. It has high production capacity, large throughput, and simple structure. Impact crusher: It is used for medium and fine crushing, processing materials under 100 ~ 500 mm, with compressive strength up to 350 mpa. It has large crushing ratio, the crushed materials are cubic particles. Sand making machine: It can be used for hard materials crushing, like river pebble and bluestone. Combined with the function of crushing and shaping, the finished product is uniform and in good shape.